The Dakota Access Pipeline (DAPL) is a 1,172-mile-long underground U.S. oil pipeline project for crude oil being led by Dakota Access, LLC, a company owned by Philips 66 from Houston, Texas; Energy Transfer Partners LP from Dallas, Texas; and Sunoco Logistics Partners LP, from Philadelphia, Pennsylvania. The pipeline begins in the Bakken oil fields in Northwest North Dakota. It travels in a more or less straight line south-east, across South Dakota and Iowa, to end in south-central Illinois, specifically at Patoka, Illinois. The pipeline pumps about a half-million barrels of oil each day. The oil is sent to the East Coast refineries and other markets by train, or down another 750 miles to the Gulf Coast through a second pipeline that Energy Transfer Partners is converting to carry oil. The project is expected to cost USD 3.8 billion. The project became public in July 2014, and informational hearings for landowners took place between August 2014 and January 2015. Dakota Access submitted its plan to the Iowa Utilities Board (IUB) on October 29, 2014, and applied for a permit in January 2015. The IUB was the last of the four state regulators to grant the permit in March 2016, including the use of eminent domain, after some public controversy. 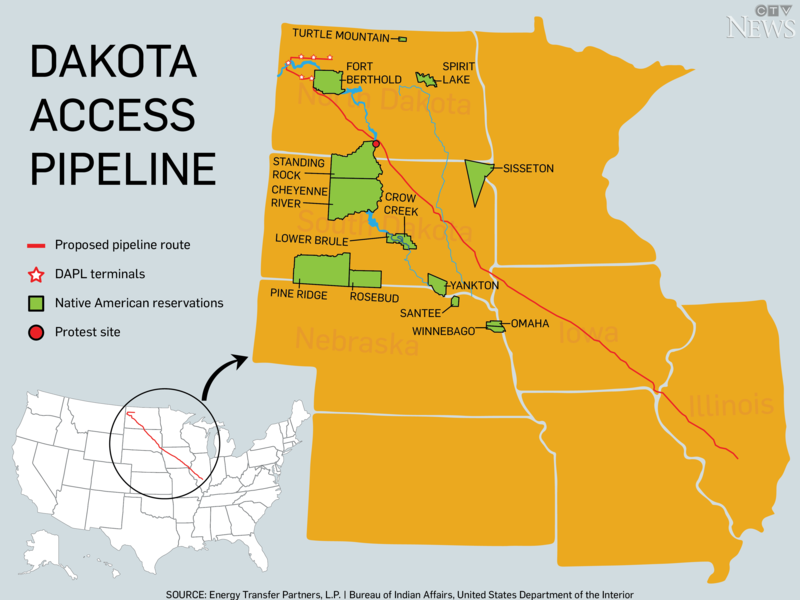 As of May 2016, Dakota Access had secured voluntary easements on 96 percent of the necessary land across four states along the proposed pipeline route. The pipeline has been controversial regarding violations of Indigenous rights, as the pipeline path crosses Native American sacred sites and threatens drinking water at the Standing Rock Sioux reservation. The pipeline is also criticized for its potential harm to the environment, impact on climate change, and for the assumption that it is necessary at all. An unprecedented number of Native Americans in Iowa and the Dakotas have opposed the pipeline, including the Meskwaki and several Sioux tribal nations. In July 2016, the Standing Rock Sioux tribe sued the U.S. Army Corps of Engineers in Washington, D.C., arguing that the pipeline threatens their culture and way of life. The resistance camp at the pipeline site in North Dakota has been called the biggest Native American gathering in history, and continues to draw international attention and support. Native water protectors at the prayer and resistance camp have been brutally confronted by law enforcement and private security forces. Indiscriminate use of attack dogs, rubber bullets, concussion grenades, tazers and mace are reported, while journalists covering the assault on non-violent water protectors have been arrested. Protesters that have been arrested have been subjected to inhumane treatmant that involved, amongst other things, being locked up naked, or cramped without food and warmth into dog kennels. 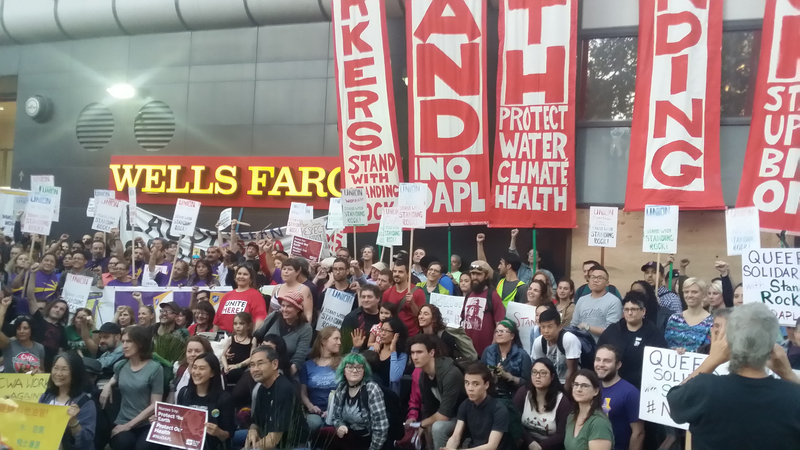 Banks must terminate their financing of the Dakota Access Pipeline construction, as well as the financing of the companies behind the pipeline. The pipeline trajectory cuts through Native American sacred territories and unceded Treaty lands, passes within 500 feet (150m) of the Sioux reservation, and threatens air and water resources in the region and further downstream. Several sacred sites were bulldozed during construction, according to the Standing Rock Sioux. In response to peaceful, on-site resistance, police from multiple U.S. states and agencies, members of the U.S. National Guard, and armed private security forces working for project sponsors used military equipment, tactics and weapons to intimidate, assault, arrest and otherwise commit grievous human rights violations against water protectors and their allies. Indiscriminate use of attack dogs, rubber bullets, concussion grenades, tazers and mace are reported, while journalists covering the assault have been arrested. The violence unleashed on the protesters by security forces left hundreds severely injured. Protesters were attacked with water cannons used in sub-zero temperatures, leading to life threatening situations. Protesters that have been arrested have also been subjected to inhumane treatment that involved, among other things, being locked up naked, or cramped without food and warmth into dog kennels. On 27th of July 2016, the Standing Rock Sioux Tribe, represented by Earthjustice, filed a lawsuit against the U.S. Army Corps of Engineers for violating the National Historic Preservation Act and other laws. The complaint says the Corps effectively wrote off the Tribe's concerns and ignored the pipeline's impacts to sacred sites and culturally important landscapes. The Dakota Access Pipeline route crosses through communities, farms and tribal land. An oil spill at this site would constitute an existential threat to the Tribe's culture and way of life, according to Earthjustice. The Dakota Access Pipeline route crosses sensitive natural areas and wildlife habitat, and involves risks to water resources and animals and their habitats. The route allows the oil company to dig the pipeline under the Missouri River just upstream of the Standing Rock Sioux Tribe’s drinking water supply. See National Geographic's overview of many of these impacts. Oil spill risks In 2010, a single pipeline spill poured 1,000,000 gallons of toxic bitumen crude oil into the Kalamazoo River in Michigan. The cleanup cost over USD one billion and significant contamination remains. And in January of 2015, more than 50,000 gallons of Bakken crude oil spilled into the Yellowstone River in Montana. It was the second such spill in that area since 2011. Since 2009, the annual number of significant accidents on oil and petroleum pipelines has shot up by almost 60 percent, roughly matching the rise in U.S. crude oil production, according an analysis of federal data by The Associated Press. Nearly two-thirds of the leaks during that time have been linked to corrosion or material, welding and equipment failures, problems often associated with older pipelines, although they also can occur in newer ones, too. Other leaks were blamed on natural disasters or human error, such as a backhoe striking a pipeline. Industry officials and federal regulators say they have adequate means of gauging the safety of pipelines, but the aging infrastructure is a source of lingering concern for outside experts (source The Chicago Tribune). The project has also involved the violation of the rights of protesters, including Native Americans, an issue also investigated by the UN. In October 2016 the UN's permanent forum on Indigenous issues began investigating allegations of human rights abuses by North Dakota law enforcement against Native American protesters, after protesters raised concerns about excessive force, unlawful arrests and mistreatment in jail where some activists have been held in cages. Indigenous leaders referred to “acts of war” they observed during mass arrests at protests. The UN Special Rapporteur on the rights to freedom of peaceful assembly and association, Maina Kiai, also criticised the use of excessive and unjustified force against protestors by the North Dakota National Guard, law enforcement officials, and private security. A federal judge has handed a lifeline to efforts to block the Dakota Access pipeline, ruling Wednesday that the US Army Corps of Engineers did not adequately consider the possible impacts of an oil spill where the pipeline passes under the Missouri river. US district judge James Boasberg said in a 91-page decision that the corps failed to take into account how a spill might affect “fishing rights, hunting rights, or environmental justice, or the degree to which the pipeline’s effects are likely to be highly controversial” (source The Guardian). In February 2017, ABN AMRO, ING, BayernLB and Nordea all announced they would step away from financing the project or its backers. ABN AMRO committed to end its financing for Energy Transfer Equity (ETE) if the pipeline proceeds without consent from the Standing Rock Sioux or with further violence. Nordea excluded three companies behind the Dakota Access Pipeline from investment. BayernLB stated it will withdraw from financing DAPL at the earliest opportunity, and not provide further finance. 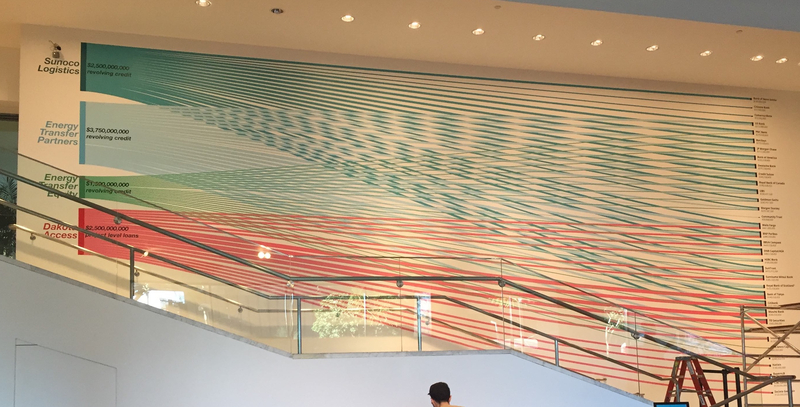 In March, ING became the first bank to sell its portion of a project loan to the pipeline. A good move followed by DNB (entered into an agreement to sell its part of the loan) and by BNP Paribas (sold its part of the loan in April). On February 8, 2017, the U.S. Army Corps of Engineers granted an easement to Dakota Access, LLC allowing the installation of a thirty-inch diameter light crude oil pipeline under Federal lands managed by the Corps at Oahe Reservoir. The granting of this easement follows the February 7th Secretary of the Army decision to terminate the Notice of Intent to Perform an Environmental Impact Statement and notification to Congress of the Army’s intent to grant an easement to Dakota Access for the Lake Oahe crossing. As fierce resistance to the Dakota Access pipeline played out on the North Dakota plains this fall and winter, other activists were putting pressure on the banks financing the pipeline. They called executives, held protests in branches, and moved their money. At least USD52 million has been withdrawn so far, according to organizers. Read more here. Donald Trump was sharply criticised by Native Americans and climate change activists on Tuesday after he signed executive orders to allow construction of the Dakota Access and Keystone XL oil pipelines. Both pipe projects had been blocked by Barack Obama’s administration, partly because of environmental concerns. But Trump has questioned the science of climate change and campaigned on a promise to expand energy infrastructure and create jobs (source The Guardian). The Department of the Army will not approve an easement that would allow the proposed Dakota Access Pipeline to cross under Lake Oahe in North Dakota, the Army's Assistant Secretary for Civil Works announced on December 4. Jo-Ellen Darcy said she based her decision on a need to explore alternate routes for the Dakota Access Pipeline crossing. Darcy said that the consideration of alternative routes would be best accomplished through an Environmental Impact Statement with full public input and analysis (source US Army Corps). ABN AMRO issued a statement denying involvement in the financing of the Dakota Pipeline, but acknowledged its credit relation with Energy Transfer Equity, the parent company of the project. Find the statement here (in Dutch). Norwegian bank DNB will reconsider its participation in the financing of the Dakota Access Pipeline if concerns raised by Native American tribes are not addressed, the bank stated on November 6. Local authorities and protesters have been clashing over Energy Transfer Partner's USD 3.8 billion Dakota Access Pipeline project, which would offer the fastest and most direct route to bring shale oil from North Dakota to Illinois. Native American tribes contend that the pipeline would disturb sacred land and pollute waterways supplying nearby homes. "DNB looks with worry at how the situation around the pipeline in North Dakota has developed. The bank will therefore take initiative and use its position to bring about a more constructive process to find a solution to the conflict," Norway's largest bank said in a statement ( source Reuters). ING, being one of 17 banks financing the Dakota Access Pipeline, with an investment of USD 120 million, expresses its concern in the following statement. The Department of Justice, the Department of the Army and the Department of the Interior issued the following statement regarding Standing Rock Sioux Tribe v. U.S. Army Corps of Engineers: "We appreciate the District Court's opinion on the U.S. Army Corps of Engineers' compliance with the National Historic Preservation Act. However, important issues raised by the Standing Rock Sioux Tribe and other tribal nations and their members regarding the Dakota Access pipeline specifically, and pipeline-related decision-making generally, remain. Therefore, the Department of the Army, the Department of Justice, and the Department of the Interior will take the following steps. The Army will not authorize constructing the Dakota Access pipeline on Corps land bordering or under Lake Oahe until it can determine whether it will need to reconsider any of its previous decisions regarding the Lake Oahe site under the National Environmental Policy Act (NEPA) or other federal laws. Therefore, construction of the pipeline on Army Corps land bordering or under Lake Oahe will not go forward at this time. The Army will move expeditiously to make this determination, as everyone involved - including the pipeline company and its workers - deserves a clear and timely resolution. In the interim, we request that the pipeline company voluntarily pause all construction activity within 20 miles east or west of Lake Oahe. On July 27th 2016 a complaint was filed by the Standing Rock Sioux Tribe, represented by EarthJustice. The lawsuit challenges the federal government's deeply flawed process for permitting the pipeline. The project is expected to go forward without any comprehensive environmental review or meaningful consultation with the Tribe, as Dakota Access secured the necessary approvals from the U.S. Army Corps of Engineers using a self-service permitting scheme that is urgently in need of reform. Details of the complaint can be found here. On August 2, 2016 17 banks signed onto a USD 2.5 billion loan to Dakota Access, LLC and Energy Transfer Crude Oil Company for construction of the Dakota Access Pipeline and the Energy Transfer Crude Oil Pipeline. This loan is expected to make up all the rest of the capital needed to construct the project. Citi, Mizuho, Bank of Tokyo Mitsubishi UFJ and TD Bank are lead banks regarding this loan. The route of the pipeline, which crosses the Missouri River near the Standing Rock reservation, was agreed in September 2014, according to dates on Public Service Commission documents. (Bismark Tribune). Update: ING, DnB and BNP Paribas all announced early 2017 that they will sell their part of the project loan. Please see here for more information. Next to directly financing the construction of the pipeline through the project finance loan, more banks have also committed substantial resources to the Energy Transfer family of companies so it can build more oil and gas infrastructure. Energy Transfer Partners has a revolving credit line of USD 3.75 billion toward expanding its oil and gas infrastructure holdings, with commitments from 26 banks. Sunoco Logistics has a credit line of USD 2.5 billion in commitments from 24 banks. Energy Transfer Equity (ETE) has a credit line with another USD 1.5 billion in commitments from most of the same big international banks. On March 24, 2017, ETE signed a new credit agreement of USD 1.5 billion. Dakota Access LLC a company owned by Philips 66, Energy Transfer Partners LP, and Sunoco Logistics Partners LP. Please note that this website is down sometimes. Leaked documents reveal counterterrorism tactics used at Standing Rock to “defeat pipeline insurgencies"
And it’s not even operational yet. Could Dakota Access Pipeline Owners Be Legally Liable for Human Rights Abuses? 2016-10-17 16:12:48 - On September 3 2016, the Dakota Access pipeline company attacked Native Americans with dogs and pepper spray as they protested against the $3.8 billion pipeline's construction. 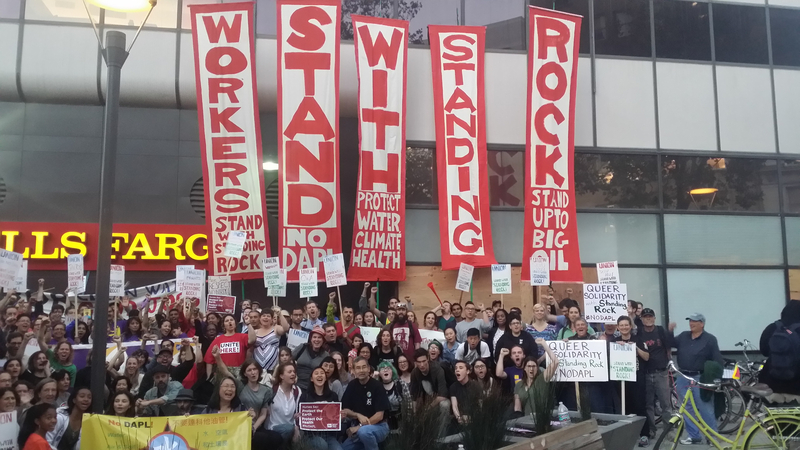 The project has faced months of resistance from the Standing Rock Sioux tribe and members of nearly 100 more tribes from across the U.S. and Canada. Amnesty International USA campaign webpage. Campaign website calling on closing customer accounts with banks funding the Dakota Access Pipeline.